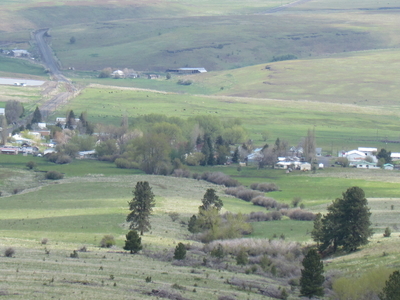 Long Creek is a city in Grant County, Oregon, United States. The population was 228 at the 2000 census. The city is named after John Long, a prominent miner who came to Grant County in 1862 during the Canyon City rush of that same year. Located in a high valley of the Blue Mountains, ranching has been the principal Enterprise for the area. Log harvesting was slowly curtailed in the nearby Malheur National Forest until the local mill was closed in 1998. As of the census of 2000, there were 228 people, 96 households, and 60 families residing in the city. The population density was 222.9 people per square mile (86.3/km²). There were 115 housing units at an average density of 112.4 per square mile (43.5/km²). The racial makeup of the city was 96.05% White, 0.88% Native American, and 3.07% from two or more races. Hispanic or Latino of any race were 0.44% of the population. The town is dominated by the school on the east side of the city. It is the number one employer in the region, and is visible from nearly anywhere within city limits. The city also has two churches—Long Creek Community Church and a Seventh-day Adventist Church. Here's the our members favorite photos of "Cities in Oregon". Upload your photo of Long Creek!